Register to Participate (High School & Middle School) performers. 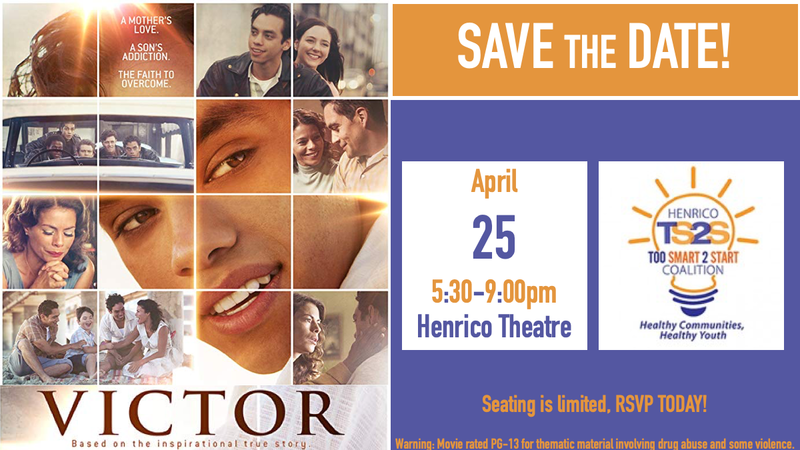 Presented by Henrico Area Youth Ambassadors. Victor is based on inspirational story about a teenager's personal and family challenges, his attempt to cope by using substances and his journey to recovery. Get Free Tickets. Presented by Henrico Too Smart 2 Start Coalition. Henrico strives to create a healthy, drug-free community. In recognition of Red Ribbon Week (Oct. 23-31, 2018), the county and its Heroin Task Force developed a six-part video series to discourage drug use and promote treatment and recovery for those struggling with addiction. If a teenager is using drugs, he or she may have items in a backpack or bedroom that might seem innocuous. Parents need to recognize the warning signs. A medication can be misused and lead to an addiction even if prescribed by a doctor. It’s your body and future. Understand the risks. The Henrico Sheriff’s Office’s award-winning ORBIT program helps jail inmates overcome addictions to heroin and other opiates and teaches workplace and life skills. Protect yourself, your family and others by safely disposing unused prescription medications. Flushing pills down the drain is harmful to the environment and not recommended. The best approach is to use a drug disposal kit or participate in a take-back initiative. DEA’s National Prescription Drug Take Back Day is Saturday, Oct. 27, with four drop-off sites in Henrico. If you or someone you love is struggling with substance abuse, hopelessness can be turned into hope. Recovery is possible with counseling and support. Many treatment options are available. #Henrico Area Mental Health & Developmental Services offers same-day access to services. Information is available at henrico.us/mhds/ or by calling 727-8515 (intake services) or 727-8484 (emergency services). Naloxone can temporarily reverse the toxic effects of an opioid or heroin overdose, allowing time to seek professional medical attention. #Henrico offers classes on administering naloxone to potentially save the life of someone you love. The city of Richmond and the counties of Henrico, Chesterfield and Hanover presented a free summit on Thursday, October 26, 2017, which examined and identified solutions for the alarming rise of heroin and opioid abuse in central Virginia. by A. Omar Abubaker, D.M.D, Ph. D.
The overall mission of the Heroin Task Force is to stop the opiate overdose deaths in our community and to promote treatment for the citizens that are affected by this epidemic.